Another year, another Planetshakers release! Yep, you did hear that right, and no, your ears were not deceiving you. After last year’s series of EP’s (Heaven And Earth 1, 2, and 3), culminating in the full length album titled…yep, you guessed it: Heaven And Earth; the Aussie worship movement has decided…that it’s time for yet another new EP. This time titled Rain Pt 1 (Live) – EP; we are met with four songs clocking in at around nearly 30 minutes, which release around a month ago. While you can read all of our reviews of Planetshakers’ albums here, at this point one might be thinking and maybe saying aloud ‘enough is enough, time to bunker down, write ‘good’ music, and take 2-3 years to record an album’. At this point, one may say that Planetshakers may not be relevant anymore, given the sheer volume of albums they release every year. 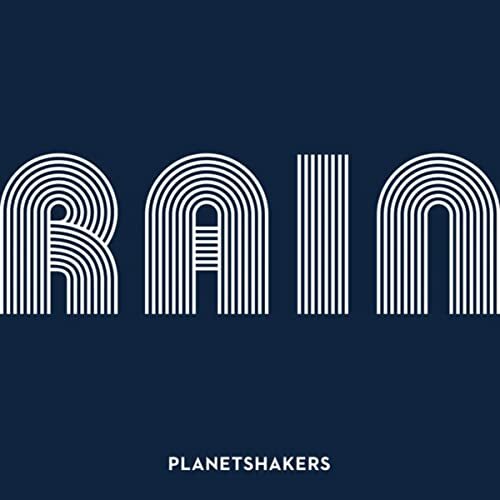 For me I am certainly getting to that stage where I’m thinking ‘another Planetshakers album- really?’, and yet there’s always a couple of songs that pique my interest and really grab my attention in a good way. However if this year’s EP’s are going to travel the same route as Heaven And Earth, then why not release Rain as a full length album in October this year? Nevertheless, these four songs in their own right are inspiring, even though there are some flaws here, as with any EP that has 2 out of the 4 songs each close to 10 minutes running time. “All Around” kicks off proceedings, and is an EDM rocker through and through, and though containing a few cliché lyrics, also contains enough passion and energy from all of the vocalists for me to enjoy this melody regardless of the un-inventive lyrics. Musically this song is quite daring, containing multiple bass guitar solos- and as an opener is a bit left field, however applause needs to be given to the band for trying out something different. Unfortunately, “I Lift Your Name Up” is lazy writing, no matter which way you slice it. Only 3 and a half minutes long, there’s way more repetition than in the EP opener, and tons more EDM/synth solos that feel just plain awkward. I know that these guys’ heart are in the right place, and I know that they’re having a blast (and that’s evident on the music video!) however me as a listener can’t connect to this specific song because of the underwhelming lyrics. It’s not an attack on the band, it’s just that I find other melodies more enjoyable and engaging- and I’ve come to expect more from the band who gave me “Rain Down”, “Nothing Is Impossible”, “I Believe” and “Healer” way back in the day. And this brings me to the two worship ballads “Right Now” and “Fire Fall”. While both are worshipful enough, “Right Now” falls flat a bit (bit still is more engaging than “I Lift Your Name Up”); and it is “Fire Fall” that pulls at my emotions and invades my heart in a very good way. But both are far too long, and could’ve been cut by 3-4 minutes at least. I understand that in a live setting you want the Holy Spirit to move and thus you want the listener to be as involved in the experience as they can- authenticity and all that; however there is a point where the song drags on. I feel it in these two songs more so than any other song this length from the band. Overall a solid and competent EP that still needs improvement and work, but also continues my interest for Planetshakers a bit more; this first EP in a new series doesn’t compare to the tracks on Heaven And Earth yet. However these tracks are on the whole inspiring and hopeful and can be cried out and sung to Jesus during times of joy and hardship. Still not as impacting or rousing as albums from Passion, Jesus Culture, and Hillsong, Planetshakers have done Australia proud as this EP has plenty of inspiring messages and uplifting lyrics about Jesus! Well done Planetshakers for still stepping out of your comfort zone and creating music even when the critics say your time is up. Here’s hoping and praying that you guys have many more new albums to come that will revolutionise the worship industry in the future!